Each year I watch Catholics complain about Lent and the upcoming 40 days of sacrifice. I suppose some people do hate Lent, but I love it, and I think — despite all the complaints — that many Catholics also love it, even as they complain. Life hands us all kinds of challenges exterior to us. Lent is the interior challenge to consent to taking an extended walk in the desert and to face what we might both find there and lose there. I was raised in the desert of the American Southwest, and in the 10 years I endured in that place, I never found any beauty, except in the fleeting glimpses of wild horses running in the distance. I wanted to run, too. Those were not happy times. But a couple of years ago, visiting Israel, I found myself in a different sort of desert, one that, in places, seemed even more desolate than the dry lands of my youth and yet was also inexplicably beautiful. In rocks, in caves, in arid and lifeless ground, the desert in Israel was golden, everywhere. But then a thought comes behind it: only in a place this empty, this rugged and unbearably hot, this dauntingly vast; only in this place of naked challenge and certain defeat could a hoped-for promise of redemption take hold and thrive. God chose His worksite well. Life lashes at us. No one escapes it without experiencing at least one episode of excruciating pain, and loss: loss of a loved one, certainly, but also loss of one’s own dignity, of a sense of safety or security; a loss of hope; a loss of one’s sense of place, or worth; a loss of belief in the goodness of others; a loss of belief, full stop. These losses, particularly if they come early and often, pull you into the desert, while you are still dewy with youth, and if you’re lucky, you will wander for a very long time, but you will survive. And if you’re looking for them, the blessings, eventually, become apparent; the promised land appears on the horizon; and you finally know that if you only keep moving, it will become enlarged in your sight, and everything will make sense, and then there will be glory. I came to love the deserts of Israel early in the course of my brief visit there, because I recognized myself — or, rather, various stages of myself, and everything I have ever known — within all that was stark and vacant, dry yet golden everywhere. Holy mystery was there, too, everywhere. In those short days, I learned to “love the empty,” as I called it, which was so expansive and total that one was forced to make peace with it, and then learn to survive. In the empty I came to realize how illusory were some of my greatest concerns — the political, the professional, even some of the personal, in terms of the over-packed and heavy baggage I’d been lugging around for too long. I discovered they could be left there; all of the excesses that were weighing me down, and distracting me from what really mattered, could be dropped and left behind, because they were that empty themselves. 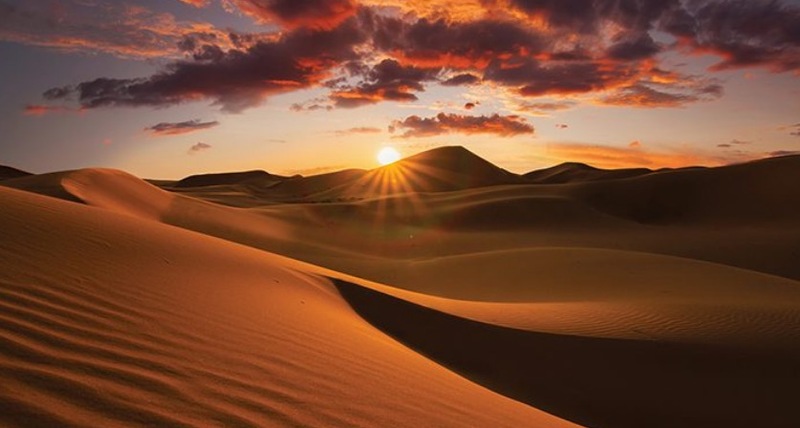 In the great empty of the desert, they became as one more grain of sand, something to turn away from in the gloaming of my life, left on the bare plains, deserted in the desert. In the empty, any ambitions I may have harbored became sidelined, and the future was kissed up to heaven. It became easy — and enough — to simply be within a day, and get through it, with faith and praise intact. So, I look forward to Lent, and I am glad to have the chance to once more enter into the desert, to be denuded of the detritus of hard times and harsh realities too long held to. I will carry them with me, into the place where light bears down, with no escaping it. And there, I will abandon them into the sand drifts of time and sun and make a sacrifice of praise.